Celebrate the new Millenium, teddy bear Style!! 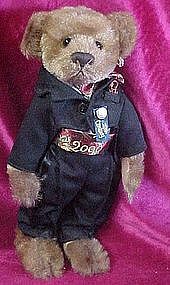 This Pickford brass button bear is from the 20th century collection and is the bear of 2000. His name is Dex. He wears a black tux with tails, and a silk paisly cumberbund with gold embroidery 2000. His bow tie and handkerchief match his cumberbund. He's ready to ring in the new millenium in style! He is 11" tall and has hand sewn detail in his paws, nose and mouth. His original paper tag is gone, but he has his original sewn tag and brass button. Great clean like new condition.